Like the convenience of an instant PDF download, but still want a hard copy of this book? Order both and save 25 percent! Frequent Case Studies Buyer? 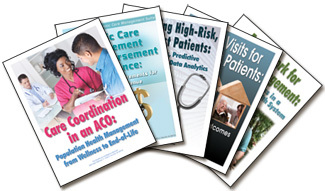 — Save more than $500 annually with our Healthcare Case Studies Membership. Click here for details. Between Medicare's aggressive migration to value-based payment models and MACRA's 2017 Quality Payment Program rollout, healthcare providers must accept the inevitability of participation in fee-for-quality reimbursement design—as well as cultivating a grounding in health data analytics to enhance success. As an early adopter of the Medicare Shared Savings Program (MSSP) and the largest sponsor of MSSP accountable care organizations (ACOs), Collaborative Health Systems (CHS) is uniquely positioned to advise providers on the benefits of data analytics and technology, which CHS views as a major driver in its achievements in the MSSP arena. In performance year 2014, nine of CHS's 24 MSSP ACOs generated savings and received payments of almost $27 million. Health Analytics in Accountable Care: Leveraging Data to Transform ACO Performance and Results documents the accomplishments of CHS's 24 ACOs under the MSSP program, the crucial role of data analytics in CHS operations, and the many lessons learned as an early trailblazer in value-based care delivery. In this 23-page resource, Elena Tkachev, director of ACO analytics, Collaborative Health Systems, describes how a robust suite of data analytics and technology supports the CHS provider community across 11 states, increasing accountability among CHS's 3,200 physicians and clinicians who serve over 280,000 traditional Medicare beneficiaries. Great references for ACO courses!